Photo sent in by Gwenda Young. This is an old photo I have of 2 of my grandfathers brothers taken at the home ground footy side. 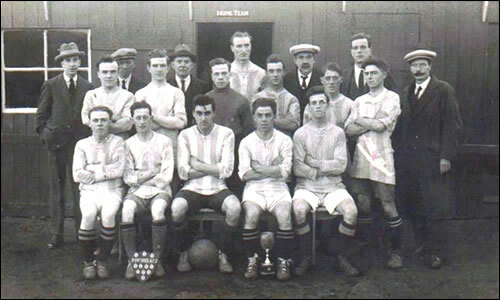 William Hunter (standing far right in middle row) and Gilbert Allan Hunter (Gilbert sitting front row second from right) both lived at Henderson Rd, Sunderland. I don't know what year this photo was taken but as my grandfather was married in Australia in 1927, then I presume it was taken before that. I do not know the names of any other team members. I would appreciate hearing from anyone who knows more about this picture and hope it helps towards the Sunderland England collection. If you recognise anyone in the team or know the name of the team, I can pass that information on to Gwenda.